Sooo (as all great blog posts are wont to start…) 2013 then. That was a year. Quite a good one for me actually. Speaking of – there’s another Maddy Cain story due out at some point from Elektrik Milk Bath Press in their Urban Fantasy anthology – no idea when though, probably sometime in late 2014. With my editor hat on (it has sparkles and feathers and room for spare red pens) the big one was The Alchemy Press Book of Urban Mythic which I’m well chuffed about. I always have a lot of fun co-editing with Jan Edwards, and Urban Mythic managed to get a fantastic line up and launched quite well too. In fact, so well did it go, that we’re doing Urban Mythic 2 in 2014! Full guidelines will be up shortly for that! Oh, and, Alchemy did a quickie interview with us about the anthology here. Convention wise, there was, of course, WFC. Which was all work. And as mentioned previously, 2014 is going to be convention play year – I’m definitely going to Nine Worlds Geekfest and Fantasycon (unless next-cousin-to-be-married picks that weekend for the festivities), and am hoping to get to BristolCon and EdgeLit, depending on time and finances. Hurrah! 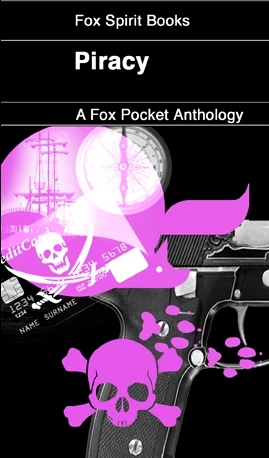 Piracy has been ebookified and is available via Wizard’s Tower Books, your regional Amazon and at some point in the next month or so at Spacewitch. And at £2 it’s a steal, so get ye-self over there and get one! There are a whole bunch of excellent stories in it, by a whole bunch of excellent people, but today I want to talk about mine! 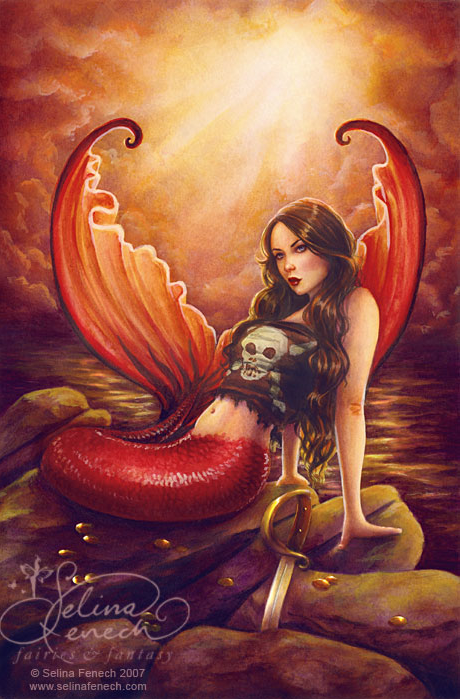 Or more specifically, why mermaid-pirates. See, according to the stories, there are two types of career options for mermaids. 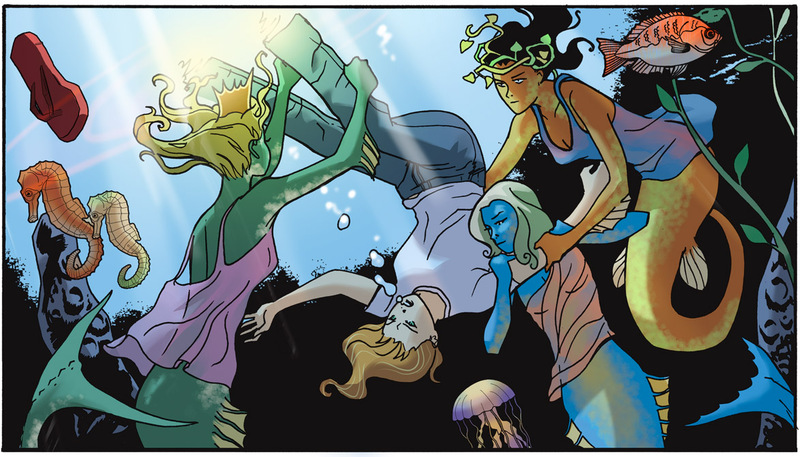 The quiet mermaids are the ladies of leisure, lounging around random rocks combing their hair and gossiping with their bestest gal-pals. Occasionally one may be inspired by stories of humans to get involved with the strange land creatures, and by assorted means pursue their target until they’re dutifully wed or consigned to death due to an enchantment gone bad. The bolshier ones are having none of that foolishness, and prefer to seduce their human prey into the water where they can drag them down into the depths for fun and drowning. Every sailor knows this. What every mermaid knows, however, is a different matter. Their stories tell of all those times their selkie cousins lost their skin to human treachery; all those times their sisters got captured for amusement and profit and were ill paid for what assistance they gave drowning humans in storm churned waters; all those times they were hunted by humans who thought they could get an advantage in fishing or just grab themselves a mermaid wife. No sensible mermaid is going to let that carry on unremarked. Not for long. And while there are plenty of activities where mermaids excel – smuggling, treasure hunting and salvage, music, art, marine sciences (of course), underwater archaeology, combat (especially of the shock troop variety), legitimate trade, hunting, exploration and storytelling; by far the most popular choice is piracy. And really, why wouldn’t it be? Mermaids have the tactical advantage in the water – they can sneak up on their targets and scuttle a ship hull without even once showing their head above the surface. Or if they want a little more sport, they can sing their prey into the water and hold them there until the air is gone from the humans’ lungs. So taking down a boat and picking the plunder out of the wreckage later is a common way to make a quick profit – after all, the mermaids have tithes to pay to sea-witches and the ruling mer-clans, so they might as well let the humans stump up the booty. But like a lot of pirates, half the fun is in the fight. When their blood gets going they like the challenge of facing the humans in open combat, matching tooth and claw and stolen blade against whatever the humans can wield. Wagering they’re fast enough out of the water to take down their foes before the biting air and solid ground turns the advantage back to the humans. And so my story “Past Lives” – where human-pirates hunt mermaids and mermaid-pirates hunt humans and the spectre of an ex-mermaid pirate captain hangs over it all.